Is it safe to keep data in AppFollow? What can I get on your Free, Premium and Enterprise plans? How does your billing work? What payments methods do you accept? How can I view or edit my billing details? How to increase Google Play limit on replying to reviews? How AppFollow is publishing replies to reviews and what is the queue? Why I don&apos;t see app version and device name on Google Play reviews? I don’t have owner access to Google Play account, how can I set-up the integration? Do you have a referral program? I&apos;m tracking user reviews, can I see the version number of each review? How to leave a review about our web-site appfollow.io? I set-up Slack integration but didn’t receive any notifications, what is wrong? If you're actively using Basecamp, set up email settings and get user reviews from AppFollow directly there. Basecamp has feature called Fowards that allow user to forward any email into Basecamp. By using it you can discuss new reviews it with your team members and improve your app together. Check this page to learn how to set up Forwards. How to set it up on AppFollow? Open main app page and click Integrations. 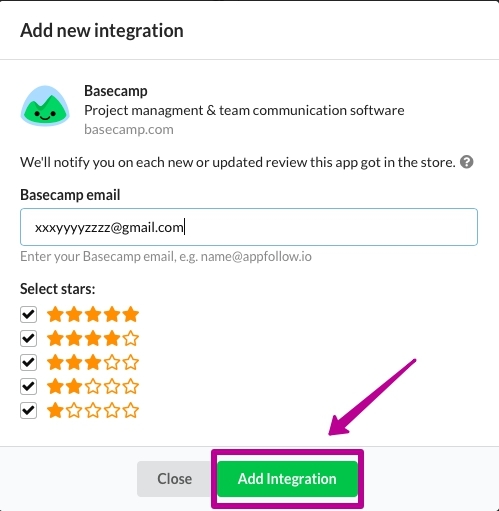 Enter the email connected to your Basecamp account and click Add Integration. That's it! Since now you will receive user reviews in Basecamp.